Description: Experience original gameplay that let's you switch between Bugs Bunny and Taz, to conquer obstacles and adversaries. Face off against classic Looney Tunes adversaries like Yosemite Sam, Elmer Fudd, Babba Chop and Count Bloodcount. Explore 4 exciting time periods - The Aztec Era, The Viking Era, The Arabian Era and Transylvanian Era. Enjoy over 30 levels of sporting contests, quests, boss encounters, and crazy chases. Play with a friend in the first ever 2-player cooperative gaming for the PlayStation! 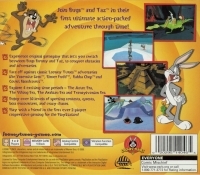 Box Text: Join Bugs and Taz in their first ultimate action-packed adventure through time! 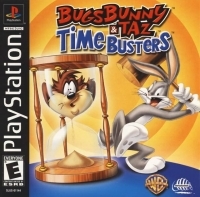 This is a list of VGCollect users who have Bugs Bunny & Taz: Time Busters in their Collection. This is a list of VGCollect users who have Bugs Bunny & Taz: Time Busters in their Sell List. This is a list of VGCollect users who have Bugs Bunny & Taz: Time Busters in their Wish List.